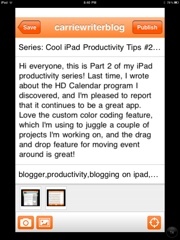 Hi everyone, this is Part 2 of my iPad productivity series! Last time, I wrote about the HD Calendar program I discovered, and I'm pleased to report that it continues to be a great app. Love the custom color coding feature, which I'm using to juggle a couple of projects I'm working on, and the drag and drop feature for moving event around is great! Now, onto other new apps. 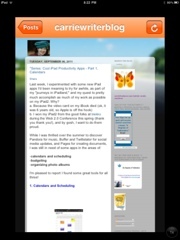 I'm typing this post using the new Blogger app for iPad that just came out on Sept 8. I was excited to hear this was coming out, as I have been experimenting both with Blogsey and Blogpress and find that they are still not as intuitive as Blogger, although I like Blogpress for its Preview capability and formatting options. This app is fairly easy to use. Just log in as you would on Blogger, adjust the settings to select which blog you are choosing if you have more than one, and type in your title and copy. A drop down menu allows you to switch to your camera to take a photo, or access your media library, which I did here. You can also select your location. So, ease of use is a definite plus. Sorry, Google, but I'm disappointed to see a lot of basic functionality missing here. *As others commented on in the iTunes app feedback area, there is no video upload capability. This is rather limiting. *No preview mode. I actually have to leave this program and go into Blogpress just to see my post preview. *As you can see by the screenshots I included, this app is really for the iphone and not so much the iPad. I'm using this tiny keyboard to type on and it feels a little ridiculous...and I'm on 2x! I'm a little tired just from typing commas and periods, as I keep having to toggle. *No advance publishing, so I have to wait until tomorrow morning to get this puppy out to sync with my social media. *No photo placement or capture features, so I have to explain to you here that these photos illustrate how my blog looks in this app, how the list of posts look, and what the new post menu looks like. 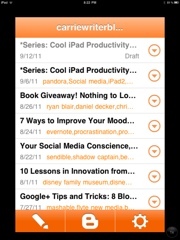 So, while I like the ease of this app, it is seriously lacking in basic blogging tools. I hope Google will address this missing functionality soon and come out with an update asap. Stay tuned for Part 3 of this series coming soon, where I'll be exploring Numbers, Apple's version of Excel, for the iPad. Now I have to go and rest my fingers.